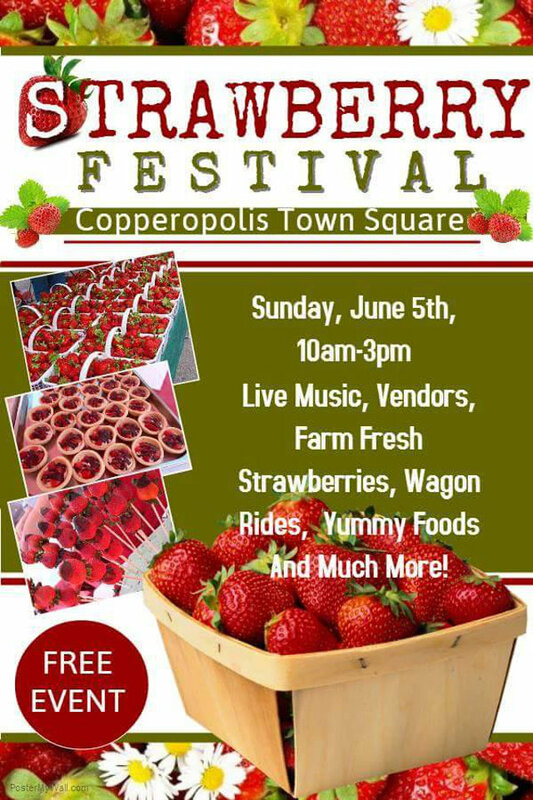 Copperopolis, CA...Hope to see y'all this Sunday for our Strawberry Festival! We have lots of fun vendors coming, a bounce house, an obstacle course, pie eating and baking contests and more! A great fun filled family day! FREE event and parking. Live music by Plan B! Our fabulous shops will be open! Our Farmers Market vendors will be here too! “Copperopolis Town Square is a quintessential place for family and friends to meet up and enjoy weekend strolls while supporting the local community,” says Kim Hamilton, Director of Marketing for Castle & Cooke Calaveras, Inc. “This summer, we are excited to host 'Market on the Square' each week so neighborhood residents can purchase healthy and organic foods, taste new wines and purchase fresh and healthy foods provided by local vendors." For more information, please call 209.785.9700. Additional details are available at www.CopperopolisTownSquare.com. Copperopolis Town Square is situated in the rolling foothills of the Central Sierra on Highway 4 in Calaveras County, two hours from the Bay Area and 1.5 hours from Sacramento. The area offers visitors a wide variety of amenities and activities including golf, tennis and dining at the acclaimed Saddle Creek Resort (www.saddlecreek.com) with accommodations for guests in luxurious Lodge Bungalows conveniently located within a few paces of the golf course. To stay for the weekend, please call 209.785.7415 to book a room.